Students will be able to determine the meaning of words using roots, prefixes, and suffixes. Write the word REHEATED on the board. Tell students: If you look at this word carefully, you might notice that it has smaller words hidden inside. Underline the root word HEAT and explain that this is the root word and, even though it is part of the word REHEATED, it can also stand alone. Explain: "A root word is the simplest form of a word. It can have beginnings and endings added to it. When we combine root words with beginnings or endings, it creates new words. Now we are going to look for the beginning and endings that were added to the root word HEAT." Point out the prefix RE- and explain that, in this word, RE- is the beginning, or prefix, that is attached to the root word to alter its meaning (e.g. “RE- means again, so when we see this word, we know that it means to ‘heat again.’”). Point out the suffix -ED and explain: "This is added to the end of the word, so it is called a suffix. A suffix can change the part of speech or tense of a word. -ED is added to words to make them past tense. That means the root word HEAT, a verb, happened in the past. So, now we know that reheated means 'heated again in the past.'" Explain: "Each of these word parts contribute to the meaning of a word. Knowing about root words, suffixes, and prefixes can help you determine the meaning of unfamiliar words." Explain: "We are going to dissect some words today to discover their meaning." Write DISSECT on the board. Explain: "DI- means two or double. SECT means cut." Write DI+SSECT on the board. Ask: “What does this word mean?” ('Dissect' means to cut in two). Write SUBMARINE on the board. Explain: "SUB- means under. MAR- means sea." Write SUB+MARINE on the board. Ask: "What does this mean?" ('Submarine' means under sea). Repeat with BIOLOGY (BIO- means life, -OLOGY means the study of) and MANUFACTURE (MAN- means hand; FACT means made or done). Hand out the Word Parts Table worksheet. Tell students: "Here is a list of a few prefixes, suffixes, and root words that you might see as a fifth grader. We are going to use this to help dissect some words." Write CENTIPEDE on the board. Tell students to look for a part of the word on the table. Ask for students to volunteer their findings (CENTI- means 100). When students have figured out that PED means foot, explain: "Even though you might not have known that PED means foot, you used what you knew about the word centipede to figure it out! Can anyone think of another word that has the root word PED in it?" (e.g. pedestrian, pedestal, pedicure). Explain: "When we don’t know what a root word means, we can use what we know about the word, like you did with centipede. Or, you can think of other words that have the same root. That can help us guess the meaning of the word." Write CYCLICAL on the board. Ask: "What are some other words with this root?" (underline CYCL). Write student responses on the board (e.g. bicycle, recycle, cycle, cyclone). Explain: "So, if the root word CYCL means circle, we know that CYCLICAL has something to do with a circle." Have students work with a partner to determine the meaning of several words using their word parts table as a tool (e.g. librarian, aqueduct, antibiotics, edible). Hand out the Roots, Prefixes, and Suffixes worksheet. 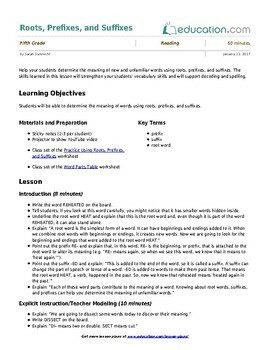 Remind students to use their word parts table as a tool if needed. 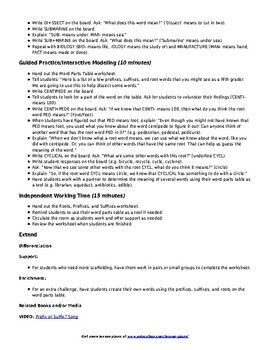 Review the worksheet when students are finished. For students who need more scaffolding, have them work in pairs or small groups to complete the worksheet. For an extra challenge, have students create their own words using the prefixes, suffixes, and roots on the word parts table. In small groups, have students create a still or moving tableau that shows what a prefix, suffix, and root are. Give students about three minutes to work with their group, then invite groups to share their tableaus (e.g. in a group of three, one student might stand tall in the middle representing the root word, while the other two students crouch and hold hands with the "root" on either side, representing the prefix and suffix). This may be challenging for students to create (and their tableaus will vary) but it will provide an opportunity to assess their understanding of the concept and will also serve as a visual teaching tool for the other students who are watching. See the resources below for additional information about using tableau as assessment. Use observations from guided and independent practice to identify students who will need additional support. Collect and check finished worksheet to check for understanding. Show students the Prefix or Suffix? video as a review. Hand out a few sticky notes to each student. Have them write a prefix, suffix, or root word they learned from the lesson or song on each sticky note. Invite students to come place each of their sticky notes on one of three circles you’ve drawn on the board (labeled prefix, suffix, root).